The KLCC Park was designed by the versatile and talented Brazilian master of gardens, Roberto Burle Marx, with the intention of seamlessly blending mankind's creations with the natural landscape. 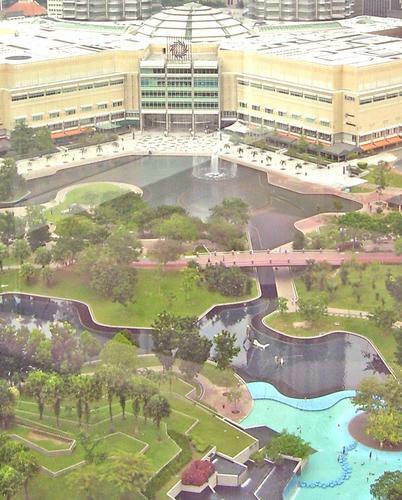 He's dead now, so we can't ask him why he designed a park in Kuala Lumpur when he was from Brazil. He did say, however, that his objective was to "leave the world a little more sensitive and a little more educated to the importance of nature." Did he think Brazil was already sensitive enough? The world may never know. At any rate, KLCC Park is gorgeous. It's a lush tropical garden that covers 20 hectares and provides a respite from the insanity of big city life. There's a waterfall, an artificial lake (we Malaysians seem to have a thing for artificial lakes), 1900 species of native Malaysian trees, and artfully combined trees,shrubs, cement structures, stones, wooden objects, and sculptures. 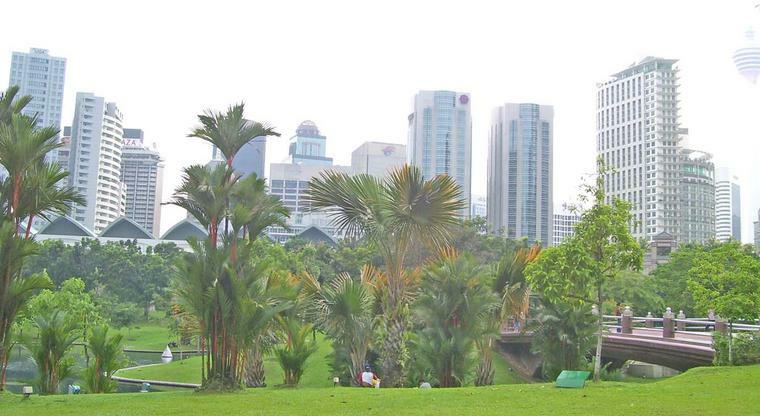 23 of the trees and other flora chosen for KLCC Park are rare or endangered, so they were put into the park to be conserved. Two of the favorite local fruits are the langsat and the rambutan, and if their trees are in bloom when you go to KLCC, you're allowed to pick them and eat them. Who says there's no such thing as a free lunch? 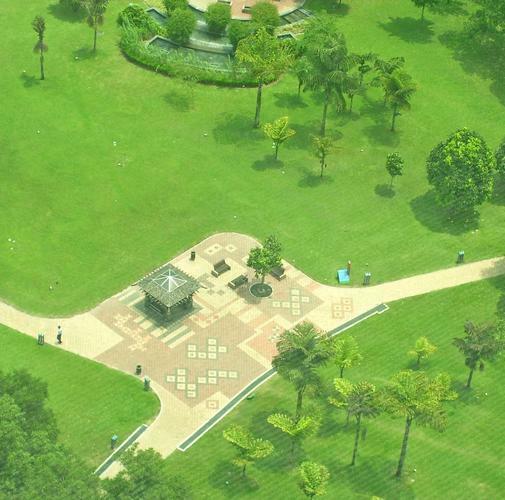 KLCC Park is also designed to become part of the "bird corridors" that are being designed in Malaysia. But set within this natural wonder, you'll also be able to find plenty of shelters, benches, rest areas, filtered-water drinking fountains, and public toilets. If you want to go for a run, there is a 1.3km jogging path that encircles the park. You'll also find a six-level shopping mall, the Suria KLCC. That's just to make you feel at home. There's also a 43-meter elevated bridge located at the center of the park from where you can get a beautiful view of the grandiose Petronas Twin Towers. One of the most incredible features of the park is the Symphony Lake, where fountainheads shoot off in sync with music. The displays comprises five programs with over 380 individually sequenced effects shooting water as high as 42 metres. These effects are displayed along the arc and the two rings totaling 80 metres in length. This is very romantic, so if you are trying to put the moves on somebody take them here. Marx apparently loved water for there are other ornamental water features in the park including the waterfalls, cascades, reflecting pools and the Bird's Pool. There's even a 0.8 hectare children's playground and a safe children's pool so that you can lose your kids for a while and go enjoy yourself. Well, okay, you can't really just leave your kids. But you know you thought about it. Just a little. However, I have to tell you that there aren't any Koala Bears in the KLCC Park. I guess they exported all of them to Australia. And I wanted to get my photograph with one!